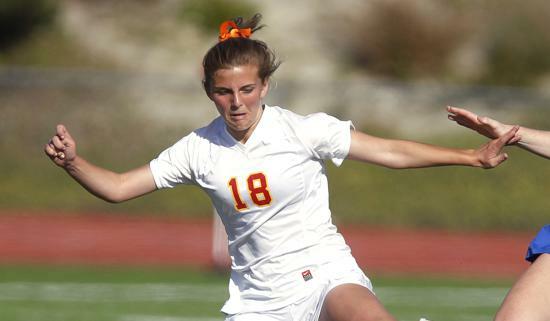 Cathedral Catholic senior Audrey Hegardt scored the winning goal in Saturday's Southern California Regional final. As a 5-foot-3 midfielder, Cathedral Catholic senior Audrey Hegardt hardly fits the stereotype of a soccer player who scores on headers. Yet that’s just how Hegardt stood out in the Southern California Regional Division II girls final. On a low ball near the net, Hegardt used her head to score with 14 minutes left to lift the top-seeded hosts past Palos Verdes 2-1 for a four-peat title on Saturday. As unlikely as her goal was, so too was her offensive production in the postseason. Hegardt scored four of her five goals on the season in six playoff games while the Dons (23-4-3) juggled their lineup with as many as five players away for junior national team summons. Back for the final was senior Sunny Dunphy, who completed a three-game stint in Spain for the U.S. 18 team on Monday. Along with Dana Dalton, she enjoyed a sweep of regional titles over her prep career. For the second straight year, the Dons prevailed after falling in the San Diego Section Open Division semifinals. This represents their fifth crown in the nine-year history of the regional tournament, all under coach Dawn Lee. Cathedral’s Taylor Sparks opened the scoring in the 23rd minute off an assist from Dalton. The No. 2 Sea Lions (22-5-2) pulled even with 17 minutes to go. Cathedral goalkeepers Erin Kelly and Kelli McCarthy, who alternated by half, combined to make seven saves.